I am back from my trip to Slovakia. My girlfriend and I have also almost completely settled into our new apartment. Which means one thing: I am ready to start cooking again. And it’s about time! The last recipe was posted almost 3 months ago. While in Slovakia, Sandra and I visited my grandma Pavka. Pavka is my “city” grandma. My other grandma, Terka, has been living in a village all her life, raising animals, and cooking dishes the old traditional way. Pavka on the other hand has lived most of her life (the part I remember) in an apartment highrise. Their cooking styles are very different. But they share one thing in common: they are both great cooks. When we stopped for the visit, Pavka treated us with little cheese bread sticks (tyčinky). I wrote down her recipe, carried it along all the way through Prague, Wiesbaden, Amsterdam, and London back to Virginia. I took it out to start cooking, realized I was missing cream cheese, ran to the store, came back – and could not find the darn recipe anywhere! So I finished making the snacks from what I remembered from the quick glance in the morning. How they say in Slovakia, od oka (by eye). I eventually did find the recipe, so the ingredients below are as given by grandma. 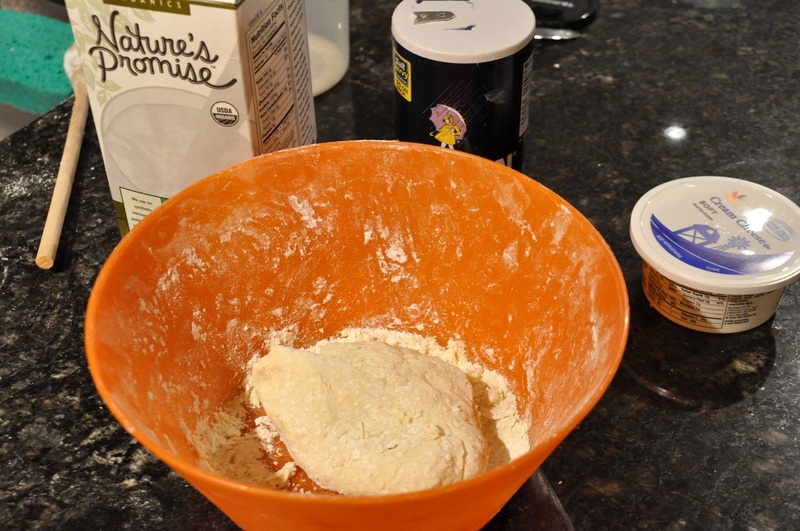 Combine all ingredients except for the grated cheese to form a fairly stiff dough. I used milk instead of margarine. 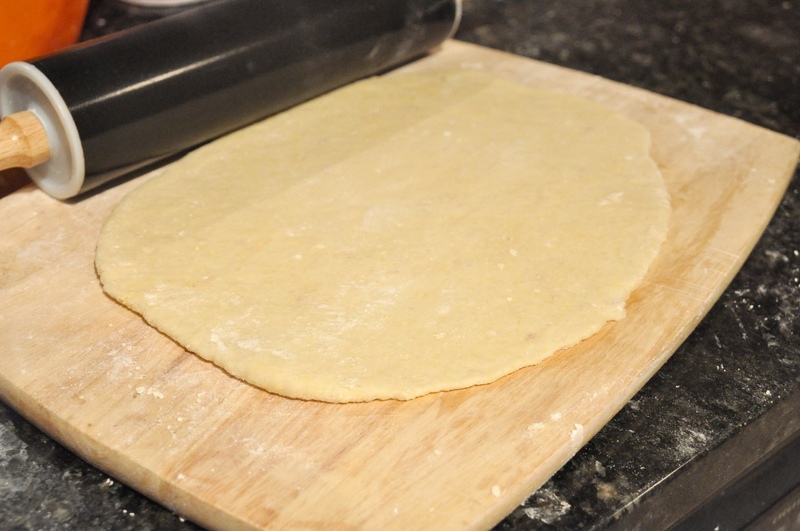 Using a rolling pin, roll the dough out on a board dusted with flour to thickness of about 5 mm. 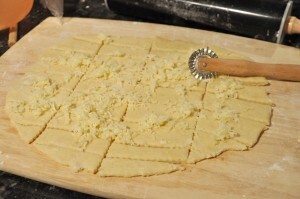 Next, using a dough cutting tool (or a knife), cut the dough into rectangles. You can put the cheese on now, but it’s better to do it after you arrange the slices on a baking sheet. If you have a large baking pan or wax paper handy, just transfer the whole sliced dough as a single piece. I instead arranged the pieces one by one in my baking pan. Grease the pan with oil first. Sprinkle grated cheese over the dough. I used a block of Jack and a hand grater. Sprinkle bit more oil on top. 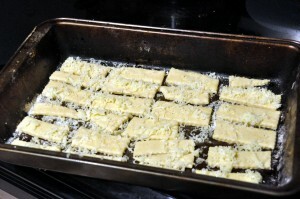 Bake in an oven preheated to 400F for about 20 minutes, or until the cheese starts turning brown. That’s it. I actually did bit of Googling post baking and found a similar recipe on varecha.sk. Their version calls for sour cream and a bit of yeast. I am Polish and I am so happy to receive all of your delicious recipes and will pass them on to all of my relatives and friends. Thank you so much for sharing them and I was so impressed with the respect and appreciation you have for your Slovak heritage. It was a pleasure meeting you and as a grandmother, I do feel it is so important to share and be proud of your culture. Thank you so much and your family can be so proud of you!!! Keep up the good work you do and you make us all happy. Now I will spend my evening enjoying reading all you sent me!!! I will try to get together my family recipes and if you like them, I would be happy to forward to you also. It is so nice to bring family and friends together with a wonderful meal that has been passed down for generations. First of all, THANK YOU for all of the wonderful recipes, many of which I have tried. I found this one particularly interesting. My Baba always made something called “Adzimka.” She was from Stebnik in Eastern Slovakia. It is basically a flat bread with colby cheese sprinkled liberally on it and then baked in the oven. Once cooled it is cut apart into squares and eaten. It is a favorite of my family. Many of the villagers in my grandparents’ area, and their descendents, make this however I have never seen it anywhere else in Slovakia. Perhaps it is a derivation of this? Dobrý deň Polly. Na webovej stránke obce Stebník je rusínsko- slovensko- anglický slovník. Prvé slovo je adzimka. Rusíni píšu azbukou, ich jazyk je veľmi podobný ruštine. Adzimka znamená v šarišsko-zemplínskom nárečí “placka “. 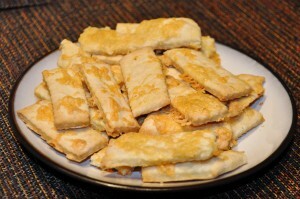 Adzimka means, Eastern-Zemplin known as “pancake”. Thanks Joyce! I’m very familiar with the Stebnik website and have traveled there several times. Interesting recipe on allrecipes.com. That would seem to be more like Pagach. Hello Polly, I look forward to. On the website tab Footprints found on the original recipe adzimku. Does your family come from Stebnik? Not Polly, I come from western Slovakia. I like this site. When I can, so to help you. Great food comes from Slovakia, I was brought up on it as my grandparents came from Liesek and Bresovitsa,small villiages close to the Polish boarder.Love to read your recipes. Ja som z Banskej Bystrice a moja mama to robila z listkoveho cesta , ktore bezne dostat v obchode. Su vyborne, posypala ich syrom ,ciernym korenim a vegetou. 1. I don’t have a recipe. 2. I think they used sheep cheese, which I can’t get here. Sonia, look for recipes on the Contents tab. Oh how I miss my Slovak family…I am the last one standing. Our church is having a family day in June. 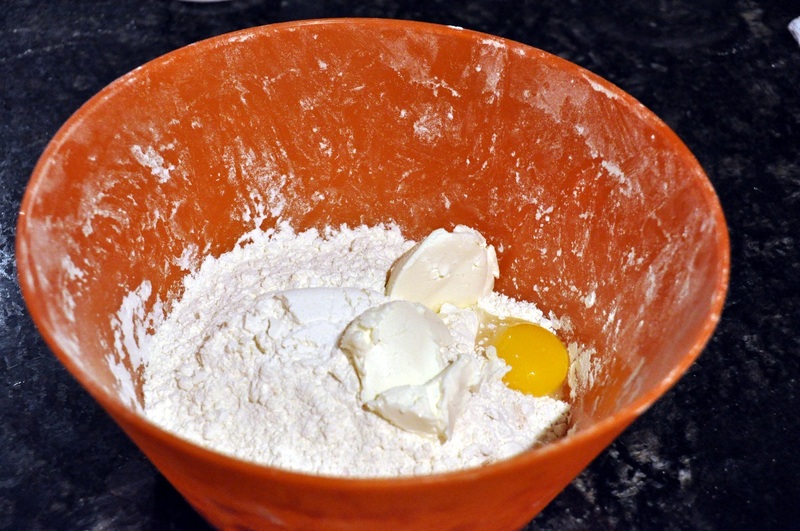 I am making halupki and halushki and I need one other simple item to offer on the menu. I will have to make everything at home and transport to the church grounds to share with approximately 100 people. Please send suggestions and recipes. Can any of the recipe be made a day or more ahead? Don’t worry, you can make all recipies in advance, after all, our old folks did the same thing, having a big pot and reheated it. Of course, some stuff is best fresh, aka boiled potatos, halushky, snitzel, etc. Yet you can ereheat it and keep going ..
My Granny used to make a bread like this. You flatten the dough then add a thin layer of cheese, egg, and a tiny amount of sugar. We called it something that sounded like pulplunky or paplunky. Did you ever hear of anything with a name like this? Try searching in Google Images “starodávny tvarohový koláč”. I’m curious about the outcome.